Yesterday at the Innate Health conference a man by the name of Dicken Bettinger spoke. And how he spoke. Dicken shared a few stories, one of which related to a troubled teen, and that’s the one that got to me, real hard. A few minutes in on his sharing my eyes started to tear up and by the end I was sobbing, uncontrollably. From a place of opposing feelings; from the deepest despair, that we, ordinary people, can innocently be so cruel to each other, to the highest hope, that if you are listened to, by someone who has an understanding of the way the world actually works (inside out), your life can change in an instant. Does that sound too easy? As if I look at turning from despair to hope with just a thought as something too lightheartedly? I ensure you I don’t. But I think you just like I, have experienced at least once in your life, a change of heart, where you go from one state of mind to another, in the blink of an eye, in the time it takes to think one thought. Everybody, everybody, is only one thought away from whatever you’re looking for, if you can find that one thought. And that one thought — do you know what it is? It’s a state of thoughtlessness, thoughtlessness from the little personal mind. This is why people meditate. The second your mind quietens down, what you call divine mind, spiritual mind, spiritual intelligence, spiritual knowledge, true knowledge — all the same thing in different names — comes into being. And you get what you call an insight, that is a sight from within, deep past your personal mind, and all of a sudden, your world changes. That’s where my hope lies. In the fact that a change of heart, a shifting of the way I see and experience the world, can happen in a heartbeat, born by the wisdom contained within one thought. That’s hopeful. And I rejoice at the fact that even though I realized the other day that I will not be coming to this type of conferences again (for now at least), I was there yesterday for an experience that shook me to the core. In the very best of ways, mind you, because I only stayed in despair for a short time. The hopefulness of it all takes over in me, and from there, beautiful things can happen. Because I know that anything is possible. That’s the message for me, after these three days at the Innate Health conference: look to and come from love and understanding. Then anything is possible. Anything. Even the seemingly impossible. Such as turning from a world of despair into a world of hope, all of a sudden. Hopeful isn’t it? I am attending the Innate Health conference in the northern outskirts of London at the moment and today is the last day out of three in total. And I had a realization yesterday right before the conference ended, having noticed something in myself both day one and day two: The standard conference format just doesn’t do it for me anymore. Sitting down from morning til late afternoon, just doing intake – listening to this interesting person, these riveting talks, this panel…. with short breaks and lunch, it’s too much for me. My head get’s filled up already by lunchtime. SImply because it’s all too good! 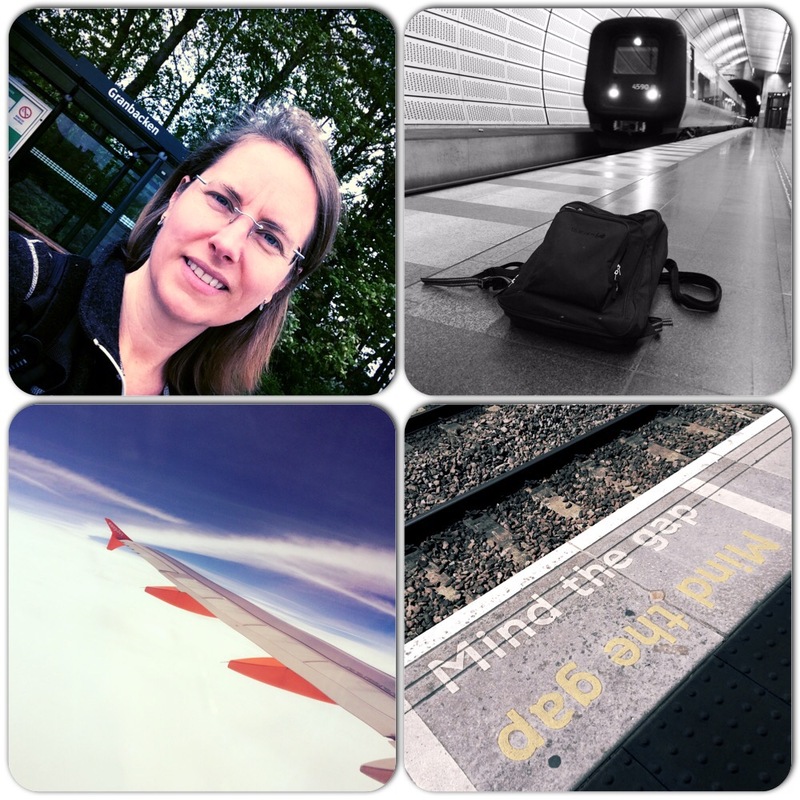 And I’m to stingy to leave – I mean, I’ve paid my ticket, I want to get the most out of it…. That last part is of course something I could learn to drop, but still. 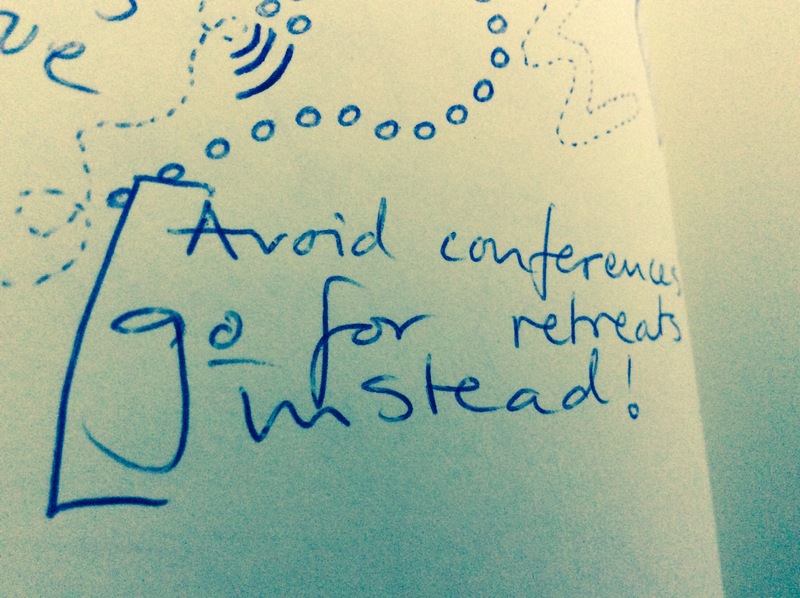 I wrote in my note book yesterday that I should avoid conferences and go to retreats instead. Doodling during the conference – with the occasional message to myself. I’ve never been on a retreat as such, but there are several that I’ve considered going to. In beautiful surroundings, with a few intake sessions/day, and plenty of space inbetween those sessions, to make sure there’s time to listen to what happens within during the retreat. It’s in the space between where the magic happens, rather than during a seminar, or a plenary panel, or a full day conference. My old self had no such issue with full day conferences. Possibly because I didn’t know that something else existed, or perhaps rather because I wasn’t aware of the magic of the space inbetween. I have learnt to reflect, to sit with myself and whatever wants to show up, these past few years, and these last days have given me the realization that I’ve changed. I like that. I love it actually. I love noticing the progression within myself, how what I do/feel/think today differs from yesterday, the year before or decades ago. It’s absolutely amazing, and I am so grateful for noticing it. It points to the limitless possibilities of life, of living on this earth, on having this human experience. As I write this I sit here with a silly grin on my face, feeling extremely happy. So. I’ve progressed. Full-day traditional conferences no longer do the trick for me, I have different preferences. Now I just need to remember this, the next time an opportunity pops up. And a few already have popped up I just realized. Hm. Time to act according to my understanding, and drop the ”Well just this one time”-attitude that is so easy to fall into when changes are to be made. What’s your best trick for following your wisdom rather than your old habits, in a situation like this? I flew to London this morning, to attend the 3P conference on Innate Health. I will be away for four nights, and I must say I am very pleased with the size of my luggage. Travelling light is really undervalued, I must say. I have yet, even though I get better at better at light travelling, to come home without something that could have stayed at home because it simply didn’t get used during the trip. Maybe this trip will be a first for that? There’s one thing I forgot though, my travel adaptor stayed at home. Luckily my Airbnb-host had one I could borrow. I immediately put travel adaptor in the template packing list I just created in Trello the other day. I did a post in Swedish with a few of the things I’ve started to pay more attention to before/during/after travels, but I am sure there are tips and tricks I’ve yet to learn, so please share yours, if you have any?